Whether you're spontaneous and free-spirited or structured and organized, scheduling and organizing your time is an integral part of having peace of mind as well as accomplishing your visions and dreams. I like to live by the idea that 100% is possible 100% of the time. And the only way that is possible for me is to schedule. I am a major scheduler, I'm actually a little obsessed with it. When I was four years old I stole a Franklin Covey Planner from the drugstore because my mom wouldn't buy it for me (because what does a 4-year old need with a planner?! Needless to say, my mom caught me and gave me my first memory of being in major trouble and having to admit my theft to the store owner... no more stealing for me haha) Over the years, I have worked at being more easy-going and fluid as well as learning how to be present and live in the moment and most people I know now think I am one of the most spontaneous people they know. Because of this, I want to give you some tips I've learned along the way on how to schedule for success, while also living in the moment and enjoying in the now. I always want to make the most of my time. I was taught from a young age the value of time and how every second that passes is a moment we can never get back. Because of this, I am very deliberate with how I spend my time and I feel like I get the most out of my days when I plan monthly, weekly, and daily. At the beginning of each month get intentional with what you want to see happen that month. What is your focus for the month? What do you want to accomplish? Who do you want to see? What fun things do you want to do? Is there something happening you don't want to miss? WRITE IT DOWN! Spend 30-60 minutes mapping out a vision for your month so that you make sure you don't miss out on anything you wanted to make happen. The main purpose of your monthly planning is setting INTENTION. For example... at the beginning of September I sat down with my planner and decided on 3 words I wanted to focus on for the month. Determined... focused... purposeful. These were my intentions. 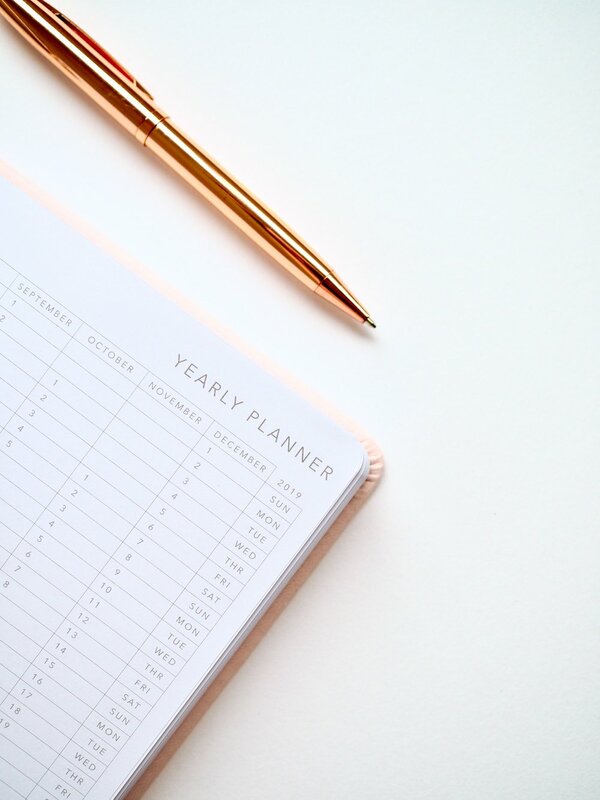 Then as I planned through the month, I jotted down things I wanted to do, plans I already had, and thought about the business and personal things I wanted to make happen. I love having these words at the top of the month, so that when I'm making decisions with my time, I know where my focus and priority should be. Each Sunday night, plan your week. This is where you look at the bigger month picture and write out a schedule for each day. What do you HAVE to get done? WHO do you need/want to spend time with? Where can you schedule in FUN and DOWNTIME? Don't forget to schedule in time to relax, we aren't meant to work constantly, and time relaxing when needed is time well spent. If you have a family, include them, then you are all on the same page. This really gives peace of mind as you physically SEE that it is possible to accomplish everything you wish to do. Again, WRITE IT DOWN. The main purpose of weekly planning is SCHEDULING. Create a ritual for daily planning. Take 10 minutes before you go to bed and 10 minutes when you first wake up to clear your head, focus, and get clear on your priorities for the day. These small chunks of time give you the GREATEST sense of peace and clarity and make all the difference. Plus, I've worked other mindset benefits into these routines. Peacefully fall to sleep, feeling accomplished and good about life. Jump out of bed and go about your day happy and grateful for the life you are living. As you begin to include scheduling into your life you will find greater clarity, peace, and will accomplish more. Make the most out of every sacred moment. Time is something we cannot get back. How are you going to use yours?